For whom do you have more sympathy: the born fool, or the capable man reduced to foolishness? The first is to be pitied, for he was given no chance to be great; while the latter, you might say, squandered his. And yet, there’s something more pitiable about a man whose dignity is stripped from him. If we’re honest, we’ll admit it could happen to us too, no matter the strength of our character. Antonio Ricci (Lamberto Maggiorani) is an average man in post-war Rome; a married father of two small children, one a baby, the other, a boy under ten. He aspires to no more than his family’s comfort, it seems: like many Roman tradesmen, he’s struggling to keep his loved ones fed, and so, when he wins a job placing posters—beating out dozens and dozens of other desperate men—he’s ecstatic. It’s a lousy job, really; you ride from corner to corner through busy streets, a ladder slung over your arm and a paste bucket in-hand, and you have to provide your own bicycle. But it’s a job, and Antonio needs a job more than anything. And so, he needs a bike more than anything. Antonio and his wife, Maria (Lianella Carrell) pawned his bicycle for food some time before this, and now they must get it out of hock. Maria, in a remarkable scene of deliberate action—of raw practicality over sentiment—rips the sheets from their marriage bed, in hopes of making up the difference to the pawnbroker. She’s a sweet little thing, but she’s hungry. Soon, Antonio is biking his way to profit, smoothing out the bumps and wrinkles in posters of Rita Hayworth, while his bicycle rests nearby. And then it is stolen. He doesn’t quite see the face of the man who rides off. This theft was inevitable, I think. It’s impossible for Antonio to watch his bike while he works—he has to face the wall when he puts up his posters. Which makes Antonio’s continued employment dependent on the good will of his fellow human beings—and that, in this film, is a maddening prospect. 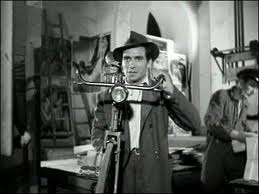 Over the course of Bicycle Thieves, poor Antonio will be embarrassed, demoralized, even roughed up, but no one will save him. Some will try, and prove useless at it; most will be part of the mob that always seems to oppose him—against which he is the ultimate individual. Antonio vows to regain the bicycle before his next day of work—I remind you, they’re in a large city. With the loyal Bruno (Enzo Staiola) in tow, he sets off through the streets to find it. He enlists the help of another labourer, a hefty garbageman named Baciocco (Gino Saltamerenda), who rounds up another two guys and suggests they all visit Piazza Vittorio: an open-air market and possible bicycle chop-shop, where bikes can be found by the hundreds, and bike parts by the thousands. 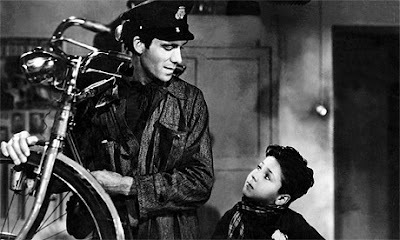 Baciocco’s plan: each of the searchers, including the boy, will look for a certain kind of part, unique to Antonio’s bike. When they find it, they’ll rejoin the group. When everyone returns, they’ll reassemble the bike. Scenes like these almost make Bicycle Thieves a comedy. Director Vittorio De Sica gives it a further nudge in that direction by avoiding close-ups of the protagonist (it’s always easier to laugh at a man from a comfortable distance). But the film remains serious for three reasons, the first being the soundtrack, which is imminent, persistent and loudly ominous; and the second being that we know, from the opening minutes, how desperate Antonio’s situation really is. His obsessive, eventually deranged quest to regain his bike is disturbingly pragmatic, because he lives in a society that would let him starve, and works for an employer too cheap to buy him a bike lock, much less a bike. Getting that stupid bike back is a life-or-death matter for him, and that’s what makes him act the fool. The third serious matter is Bruno. I never doubted that Antonio loved his son, who is a cheerful and rather mature little man, but the longer Dad’s odds got, the more quickly he seemed to forget his son was running behind him, struggling to keep up. Count how many times Antonio barrels after some half-baked ‘lead’, leaving Bruno in the dust. Were something to happen to Bruno, he would be devastated, but one might argue, at least in the heat of the moment, that the theft of the bike already ‘happened to Bruno,’ because if Dad has no job, Bruno won’t eat. No one can help. The police give Antonio polished speeches about lack of evidence, while a Catholic seer proclaims: “Either you find it right away or you never will,” offering no clues as to where the bike might be. Antonio, meanwhile, breaks one cultural taboo after the next: barging into a church, for example, to interrogate an old man who might know something (but probably doesn’t); then doing much the same thing to the residents of a whorehouse. He throttles a teenager who may be the thief—who then drops to the ground in an epileptic seizure—and Antonio is surrounded by a crowd of angry men, not much different from the crowd that cursed him when he won the job they all wanted. He is alone, but for Bruno, who witnesses his every personal failure and absorbs the example they set. The film ends as it must, for Antonio can only follow one trajectory, dictated from the start by his miserable situation. Bicycle Thieves is no more than a movie about a man with a simple problem, which he attempts to solve in a straightforward way. His challenge is to persist, and so he hasn’t the luxury to ask why such a problem exists in the first place, or what options he really ought to have. There is no thought given to his ‘rights.’ But what of Bruno’s rights? Sharp, honest, earnest Bruno: his Dad makes mistakes, and Bruno has to live with them. I couldn’t help but think, as I watched them both, if we were really seeing the story of how Bruno Ricci grew up. 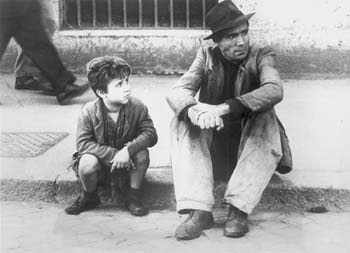 Bicycle Thieves (Ladri di biciclette), also known as The Bicycle Thief, screens at 6:30pm on July 28th, 2011 at Toronto’s TIFF Bell Lightbox—part of Days of Glory, Masterworks of Italian Neorealism, a retrospective running from July 28th to August 28th. Read my review of Il Posto (1961), also part of the retrospective, right here. A really great film. Touching and heartbreaking with a good moral.